Now is about the time all of you tea sippers should look away, because we're talking coffee! Wholesome, aromatic, bold espresso to be exact. Some say a shot of espresso is the best, most effective energy drink on a Monday morning. So leave that 5-hour energy at home, and bring with you one of these bad boys. Meet the Twist V2 by Mypressi. It's the portable, handheld espresso machine you can take with you just about anywhere to pull yourself a fresh shot of delicious espresso, courtesy of your favorite blend. 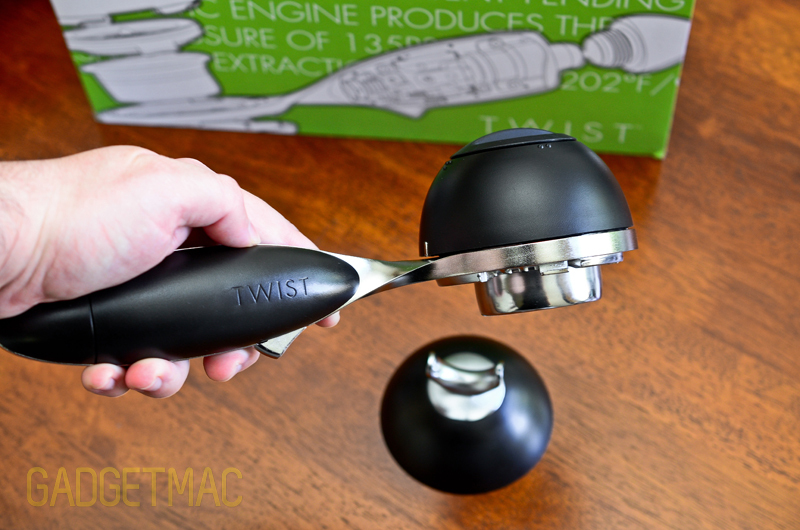 We took the Twist V2 for a little espresso making spin to see if it really can recreate a quality shot comparable to full fledged machines that run upwards of $2,000 as Mypressi claims. 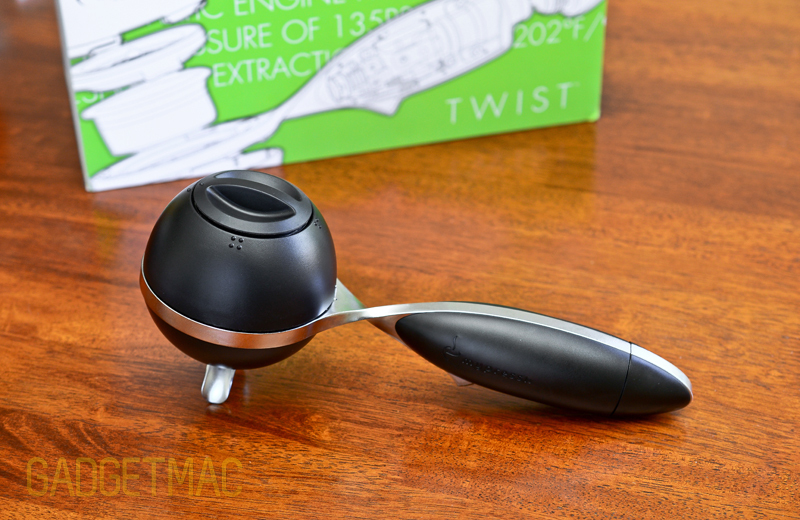 Mypressi's Twist V2 is a remarkable machine that requires no plugging in of any sort which is why they call it portable. The Twist uses a patented pneumatic technology that produces 9 bars of pressure using a single standard N2O (Nitrous Oxide) gas cartridge, the same widely available cartridge you would use for a whipped cream canister, which is the source that powers up the Twist V2 and delivers the intense pressure that forces the hot water stored inside its metal dome-shaped water bowl down into the espresso pod and out thru the metal showerhead creating the espresso with a push of a button. On the spot. 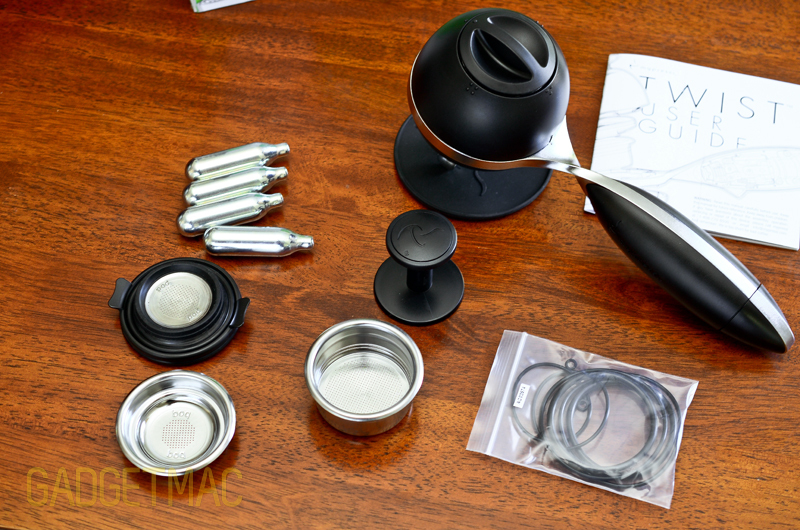 The Twist V2 will run you $169 (or $118 for a reconditioned unit) making it one of the most affordably priced espresso devices that can produce a professional shot of espresso on the go. Though portability does have its price. 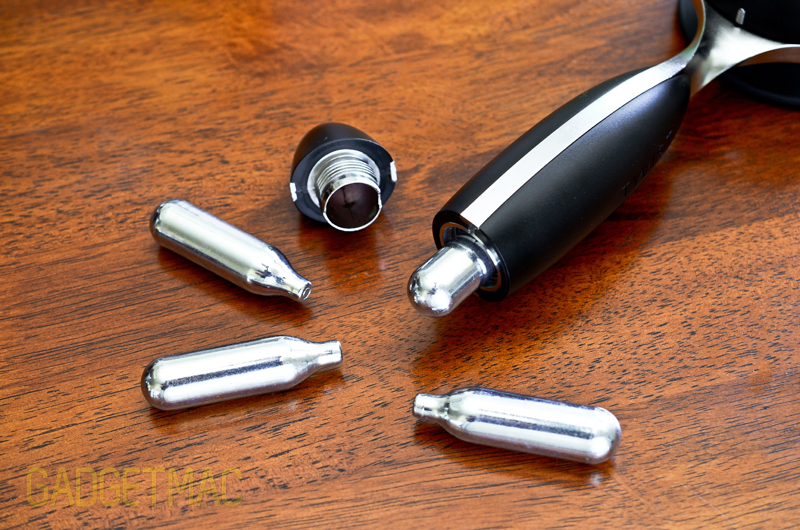 The downside is that you would need to purchase N2O gas cartridges in order to power the Twist V2. Each cartridge is good for only 4 rounds of double shots or 8 rounds of single shots. One cartridge is loaded into the handle at a time. In our taste, a single shot is not enough espresso to quench your thirst, or better yet, to deliver your caffeine dosage. Mypressi sells a box of 24 for $16. 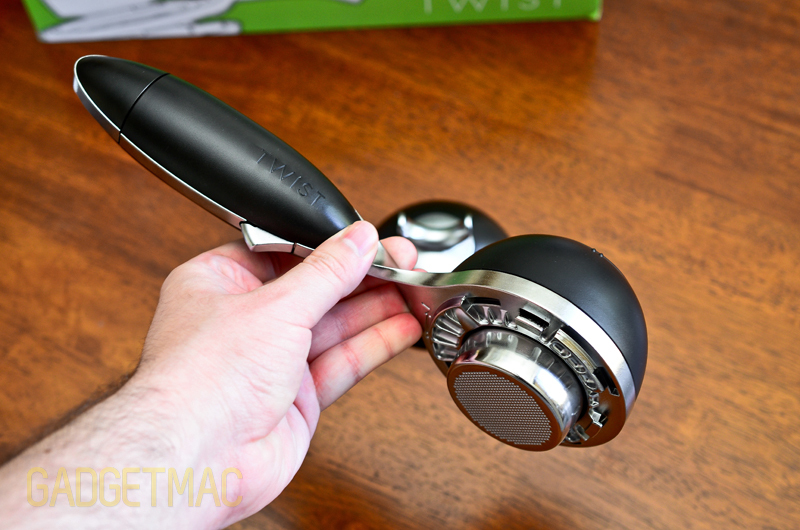 The Twist V2 is beautifully designed and certainly justifies its twisted name. 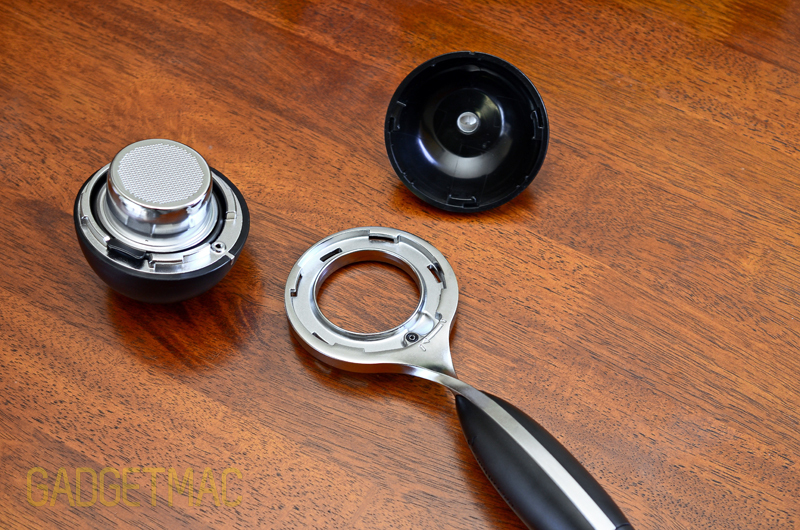 From the elegant twisting handle to nearly every part that makes up this handheld espresso maker twists and turns into place, which makes for an effortless disassembly. It's truly a unique design that we've never seen before. You can see the multiple attempts at pulling a perfect shot in our hands-on video above. Some were done without the Twist's bottom dual-spout known as a bottomless filter extraction using the included standard double-shot filter basket. We used pre-grind Lavazza espresso. Using the Twist is pretty easy to use and it comes with a nice little starter kit to get you going right out of the box. It comes with everything you could possibly need, and we will go over the contents further down. While using it is easy, making espresso using the Twist V2 requires the standard knowledge of using an espresso machine, naturally. You've got your basket that you'll need to fill with your espresso grinds, preferably using a very good grinder, and tamping using standard pressure. 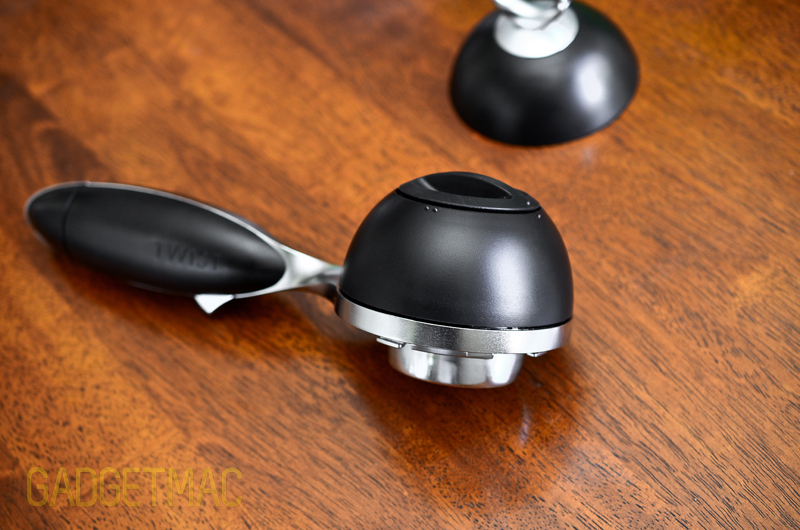 We noticed that the Twist favors a very fine grind, pre-heating and a steady hand in order to pull a quality shot. We're no experts in making espresso, but we know a thing or two to pass a decent shot. All that's left is to fill up the water bowl from the top using boiling water and pull on the trigger to initiate the extraction. You don't need to worry about overfilling since there's only enough room for you to fill water to make a double-shot. Once the Twist V2 is done pulling your shot, it'll depressurize itself. 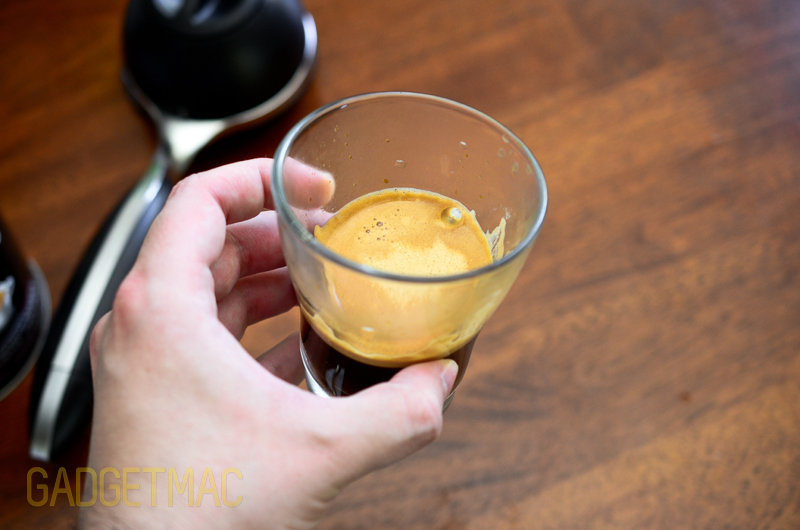 In our testing, the Twist 2 produced surprisingly amazing rich crema with an extraction that was slightly on the sour side. But we have a feeling we're to blame for that. This is heavily a your-mileage-may-vary type of situation, and a lot of it rests on your skills of preparing your espresso grinds and tamping technique. The build quality of the Twist V2 is second to none. Picking it up feels substantially solid. Most of the parts are made using heavy metal which include the water bowl, showerhead, handle frame and the coffee baskets. Metal is of course a great material to see being used, but the Twist V2 has so much of it, that some of the parts require prior heating so that you'll be able to pull an excellent shot of espresso. The whole pre-heating thing is a bit cumbersome and makes producing only a single cup a painstaking process which for the espresso fanatics is a mere drop in the bucket. You'll need to insure that your metal elements are properly heated before you even think about pulling your first shot, and that means pouring boiling water into the water bowl and waiting for the metal to warm up. If you pass up heating the Twist V2's interior reservoir, your shot won't be as good and you will lose the necessary heat required for a great shot. We're no big fans of the method you need to use to keep track of how many shots you can pull until your gas cartridge goes empty. There are dots around the opening of the water bowl for you to point the lid on each time you fill it up to keep track on which number of uses you're on. You can easily forget to keep count, and ruin your shot using a near empty cartridge. The trouble with using a portable espresso maker such as this one, is that it obviously isn't a fully featured stationary machine. Which only means one thing, no frothy milk for making your cappuccino. For that, you'll need a separate milk frother that'll heat up your milk separately. But the two combinations really aren't convenient to use in order to make a mixed drink. 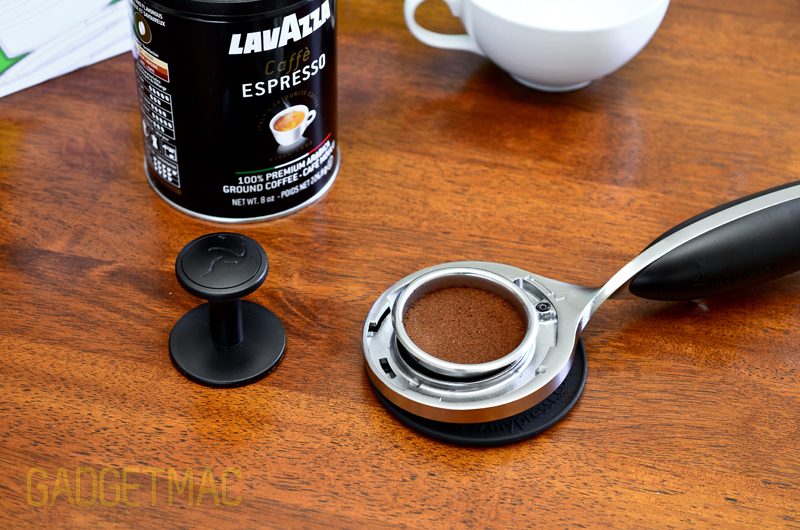 We see the Twist V2 to be more useful for making espresso shots, and that's about it really. Making the perfect shot, or cup of espresso is not easy task and takes more time and dedication than pressing a button on your coffee brewer or making a cup of tea. If you like seeing that golden, reddish brown concentrating stream of goodness spewing right into your tiny espresso cup, the Twist V2 will get the job done. With that said, if you aren't familiar with making espresso, this is not the right machine for you to sharpen your skills with. You'd be better of starting with a home machine that would be easier to operate and can quickly let you make espresso. Mypressi's Twist V2 will give you a great bang for you buck and a wonderfully rich espresso that if done correctly, can match that of a much more expensive machine. But it does come with its caveats so only and only if you feel like you know your stuff using such an espresso contraption and are willing to trouble yourself in making your dark elixir shot a worthy one, this is one amazing handheld espresso maker that you can grab with you on the go. Inside the box you will find four N2O gas cartridges to get you started, a 53mm plastic tamper which fits the included baskets snuggly, a round rubber tamping/drip catcher mat, multiple extra rubber O-rings in case you wash away yours, a travel pouch and three different filter baskets. One 53mm double-shot basktet, one 53mm pressurized double-shot basket and one ESE pod basktet with an adapter and ESE showerhead.